Those words of welcome, from Fred in Brasilia, joined about 30,000 more messages for President Obama as he made his first visit to Brazil this past March. To help celebrate the president’s visit, we helped the United States Embassy in Brasilia develop “Boas-vindas Presidente Obama”, a social media campaign to raise interest in the president’s visit. A major objective of this program was to help Brazilians engage with the President’s visit beyond the handful of public events and the usual TV coverage. Brazil is a continent-sized nation with more than 190 million people, so the opportunities for Brazilians to actively participate were unfortunately limited. Social media provided a solution. ?The visit also provided an opportunity to increase mutual understanding and further dialogue with Brazilians on priority themes (such as education, the environment, clean energy, global partnerships, and other topics). 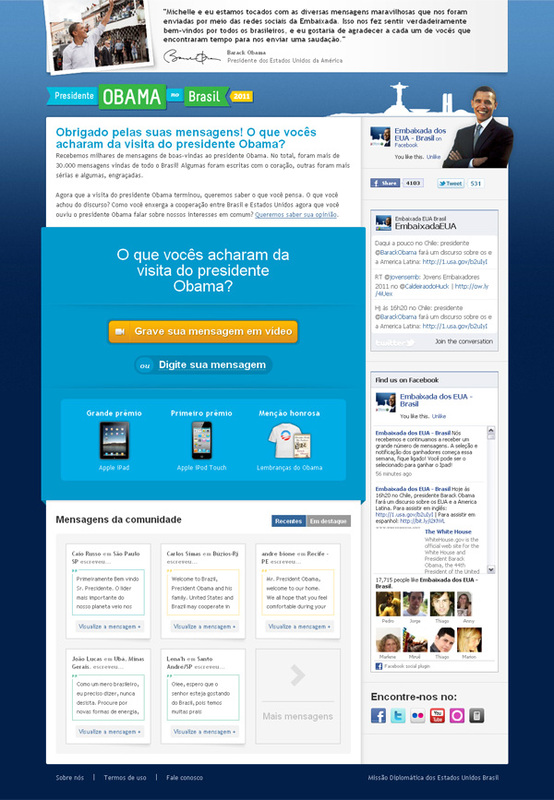 The concept was simple: create a campaign driven by social media where Brazilians could submit short welcome messages to President Obama. These were collected in two mediums: short text messages and 15 second videos recorded through the participant’s web cams. The text messages were gathered through a custom-built application we designed and developed within the State Department. On the video side, we turned to VideoGenie, a web start-up. Since the Brazilian social networking landscape is quite diverse, we utilized a wide variety of platforms to get the word out and to collect welcome messages. 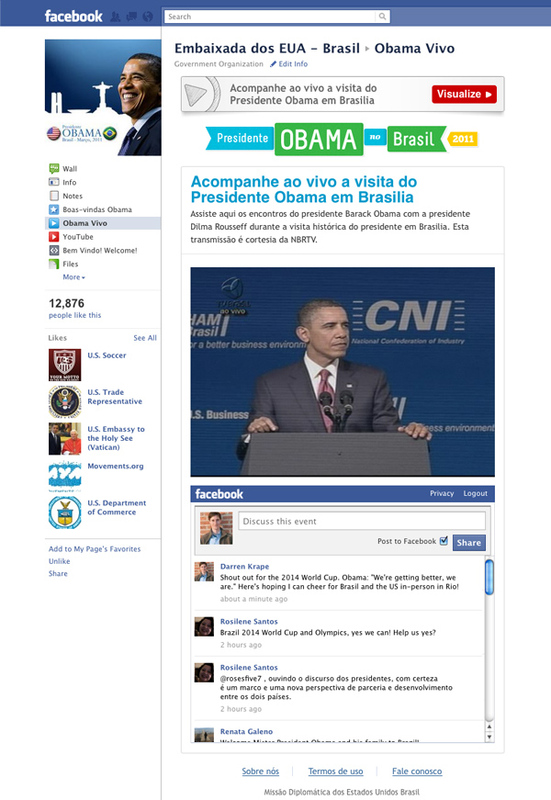 A key goal was to increase the size of US Embassy Brasilia’s communities on Facebook and Orkut pages. For Facebook we created an application housed within the fan page. This allowed us to integrate our Facebook efforts and direct Facebook advertising to both the fan page and application. Orkut doesn’t provide an application framework for their brand channel, so we created a microsite at www.obamabr.org. This also gave us added flexibility on the design and content that wasn’t feasible within Facebook. We also integrated the various social sharing tools, primarily Facebook and Twitter buttons, to help encourage people to share the wider program, but also, importantly, the individual messages they recorded. This made it easier to track how many mentions we had on the various social networks. The messages came in from all across Brazil, from small hamlets in the Amazon to the bustling metropolises of Rio de Janeiro and Sao Paulo. As Fred’s welcome suggests, Obama’s story resonates personally with many in Brazil’s diverse population of 190 million people. The program also demonstrated the warmth and hospitality of the Brazilian people. Indeed, many people invited Obama to their houses to join their families for dinner. The welcome campaign Facebook application showing the live video feed of a press conference. My role was primarily as the design and development lead, with the help of our developer Jeff Hunter. I also provided strategy advice based on the past presidential trips I’ve supported. In a single hectic week we developed and soft-launched the application, microsite, and a backend system to moderate the incoming messages. Throughout the next two weeks leading up to the visit we continually made improvements and added features, with a particular emphasis on bringing more people to the embassy’s Facebook page. The site was coded in PHP using the brilliant PHP-framework CodeIgniter. Without a doubt we could not have launched as quickly as we did without the aid of this framework. When we started to get significant press coverage and traffic spiked, the built-in caching functionality of CodeIgniter was a server-saver. The fan base of the embassy page increased from about 2,300 to 21,800 at the end of the program, an increase of about 19,500. This increase was partly driven by Facebook advertising, but much of the growth was due to the welcome message campaign. More than 32,000 welcome messages were received from dozens of cities and towns across Brazil. Of the collected messages, about 500 were videos, with the remainder text only. Following the visit, about 1,500 reactions to the visit were also collected. The Facebook application and microsite together received about 160,000 visits over the three weeks the program was live. Daily totals of incoming messages from the 11th through the 23rd of March 2011. The campaign also received significant media by prominent Brazilian outlets. Estadao, the second largest paper in Sao Paulo by subscribers, prominently featured an article about the campaign. The campaign was also featured by: Gizmodo Brazil, TV Globo’s G1 Political web site, R7 Noticias, and MacMagazine, and several others.